There's a big, bright display on the Honor View 20 and it's one of the first smartphones to adopt the "hole-punch" style selfie camera. The camera is placed beneath a round cutout below the LCD panel as a way to maximize the display area of the phone. 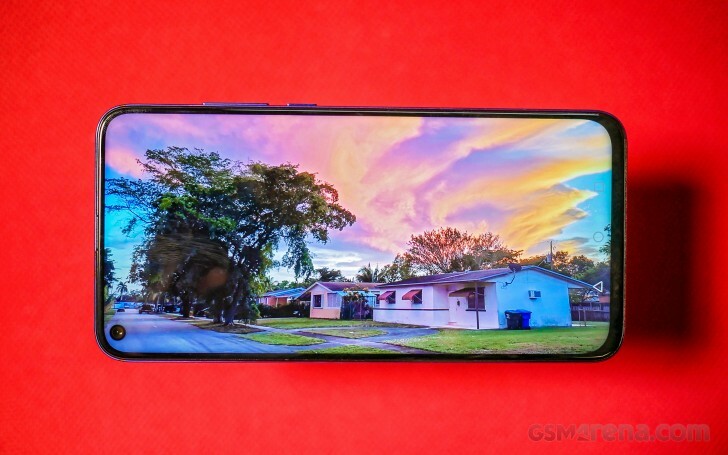 The "hole-punch" camera is the evolution of the dreaded "notch" - a larger cut-out of the top edge of the screen reserved for the front camera, sensors, and the earpiece. Despite such a small bezel around the top of the display, Honor managed to cram an earpiece speaker, a proximity sensor, and an ambient light sensor into this razor-thin bezel. You might notice some slight discoloration or shadow of pixels in the area immediately surrounding the camera hole. Honor said that this is completely normal and is a special technique used to prevent any light from leaking into the 25MP selfie camera. It isn't blatantly noticeable in person but if you really want to tickle your OCD bone, just stare at it for a while. The display itself is a 6.4-inch IPS LCD panel. Honor has always opted to use LCD panels in its devices and really reserves AMOLED panels for its higher-end devices like the Honor Magic 2 and the Honor Note series. In any case, the lower bezel is not as thin as the top and side bezels, but we're seeing this lower bezel get thinner and thinner with every new phone that comes out. The display's brightness is about average in terms of sunlight legibility - you may find yourself squinting to see what's on the screen on a bright summer day. The panel maxed out at 479 nits regardless of whether auto-brightness is enabled or not. You'll also be able to dim this display very low down to only 1.1 nits. Nevertheless, the sunlight contrast ratio score is pretty good and even beats the Huawei Mate 20 by a huge margin. We can even go further and say it enters the OLED territory. Color accuracy out of the box was quite terrible but it can be tweaked to a far more accurate setting. The default "Vivid" color profile is saturated and bright but the whites are halfway between sky blue and gray, which, frankly, makes us want to keep the blue-light filter enabled at all times. The default color profile yielded an average deltaE of 7.3 and a max deltaE of 12.8. There's a "Normal" color profile which makes a drastic improvement to the appearance of colors and tones down their intensity as well. This profile had a much lower 3.1 average deltaE and a Max deltaE of 6. When we played with the custom setting, we were able to achieve an even better average deltaE of 1.5 and Max deltaE of 2.3. There's a large 4,000 mAh battery in the View 20 and the included Huawei Super Charger is a great touch. The adapter pours 22.5W into the device and charges the phone up from a dead battery to 59% in our 30-minute charge test and reached 94% in one hour. The View 20 has a larger battery compared to the View 10's 3,750 mAh. Although the battery is bigger and the 7nm Kirin 980 CPU is more efficient, the added screen size might even out any improvements to overall battery life. Update, Jan 25: New findings lead us to re-test the battery test in standby, which turned out to be a lot better than before, so we've updated the endurance score accordingly from 88h to 96h. The final battery score is great - 96h where the video playback, standby and 3G talk times are better than expected. However, the web browsing test is just about average, considering the huge 4,000 mAh battery. 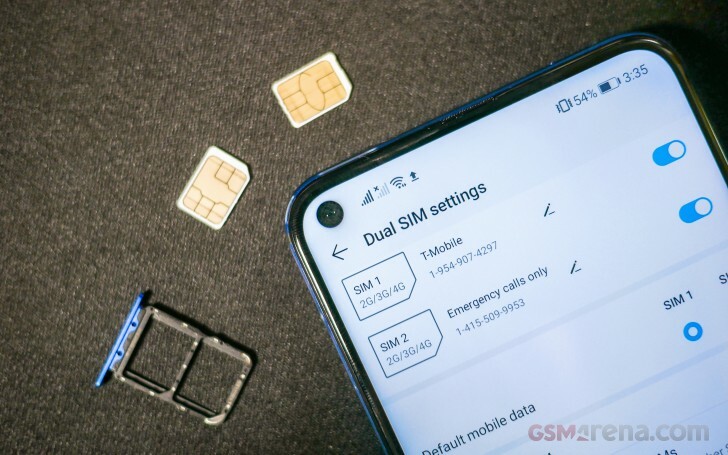 The Mate 20, which has the same SoC and battery scored better in our web browsing test. Still, the final scores of both phones are quite similar with the Honor View 20 having the edge on the Mate 20. Our battery tests were automated thanks to SmartViser, using its viSer App. 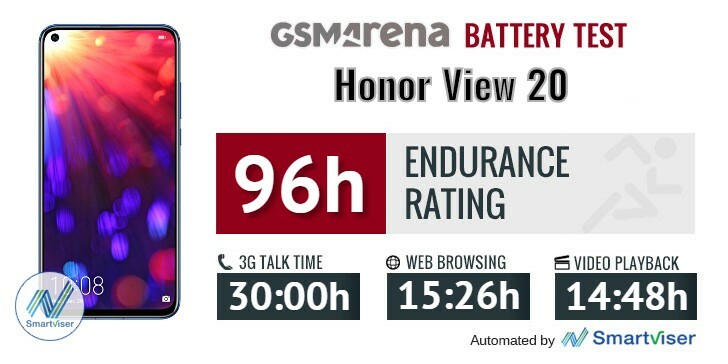 The endurance rating above denotes how long a single battery charge will last you if you use the Honor View 20 for an hour each of telephony, web browsing, and video playback daily. We've established this usage pattern so that our battery results are comparable across devices in the most common day-to-day tasks. The battery testing procedure is described in detail in case you're interested in the nitty-gritty. You can check out our complete battery test table, where you can see how all of the smartphones we've tested will compare under your own typical use. Honor's Magic UI has come a long way and if you like to control every aspect of power consumption, the battery menu lets you allow and restrict apps from running in the background on a per-app basis. Of course, keep in mind if you limit background activity from, say, Facebook, you won't receive push notifications until you open the app. The Honor View 20 has a standard bottom-firing single speaker that can get loud enough so you can hear it in a noisy pub or at a show. It's scored Very Good rating in our standard testing procedure which involves playing back three different sound sources. When paired with an active external amplifier, the Honor View 20's audio jack delivered an output of average loudness and mostly great clarity save for the surprisingly high stereo crosstalk. In fact, this is arguably the only phone in the last few years that actually has better stereo quality with our standard 32ohm testing headphones than without them. The headphones performance, in general, is great as far as clarity is concerned with the average loudness being the only non-impressive bit here.